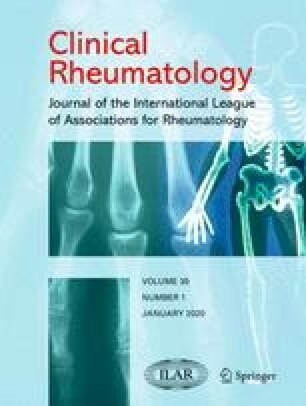 The lymphoedema of the extremities is a rare complication of rheumatoid arthritis (RA); it does not appear to be correlated with positivity for rheumatoid factor nor with the clinical activity of the disease. The authors describe 6 cases of lymphoedema in patients affected by RA; in 3 of them the lymphoedema was localized in the upper and in the remaining cases in the lower limbs. Four patients, (one of whom has been subjected to a lymphoangiography which demonstrates an obstruction of the deep lymphatics), presented an increase of the plasma fibrinogen degradation products (FDP). This could confirm the hypothesis according to which the lymphoedema could be attributable to an obstruction of the lymphatics caused by fibrin and other degradation products of the coagulation system. In one case the authors underscore the therapeutic effectiveness of lymphodrainage associated with administration of diuretics.